The third appetizer for my Ottolenghi dinner was this gorgeous hummus. The hummus was delicious on its own but I loved it even more with the lemon sauce on it. The lemon and parsley make this sauce fresh tasting and vibrant. The green chili gives it a bit of heat. I loved the heat but if you'd prefer it not spicy, just omit the chili. Enjoy! 1. The night before, put the chickpeas in a large bowl and cover them with cold water at least twice their volume. Leave to soak overnight. 2. The next day, drain the chickpeas. Place a medium saucepan over high heat and add the drained chickpeas and baking soda. Cook for about 3 minutes, stirring constantly. Add the water and bring to a boil. Cook, skimming off any foam and skins that float to the surface. The chickpeas will need to cook between 20-40 minutes, depending on the type of freshness, sometimes even longer. Once done, they should be very tender, breaking up easily when pressed between your thumb and finger, almost but not quite mushy. 3. Drain the chickpeas. You should have roughly 3 2/3 cups now. Place the chickpeas in a food processor and process until you get a stiff paste. Then with the machine still running, add the tahini paste, lemon juice, garlic and 1 1/2 teaspoons of salt. Finally, slowly drizzle in the ice water and allow it to mix for about 5 minutes, until you get a very smooth and creamy paste (I had to add a little more water to get the consistency I wanted). Adjust the seasoning if needed. 4. Transfer the hummus to a bowl, cover the surface with plastic wrap and let it rest for at least 30 minutes. If not using straightaway, refrigerate until needed. Make sure to take it out of the fridge at least 30 minutes before serving. 5. For the lemon sauce, combine all the ingredients in a bowl and stir well. 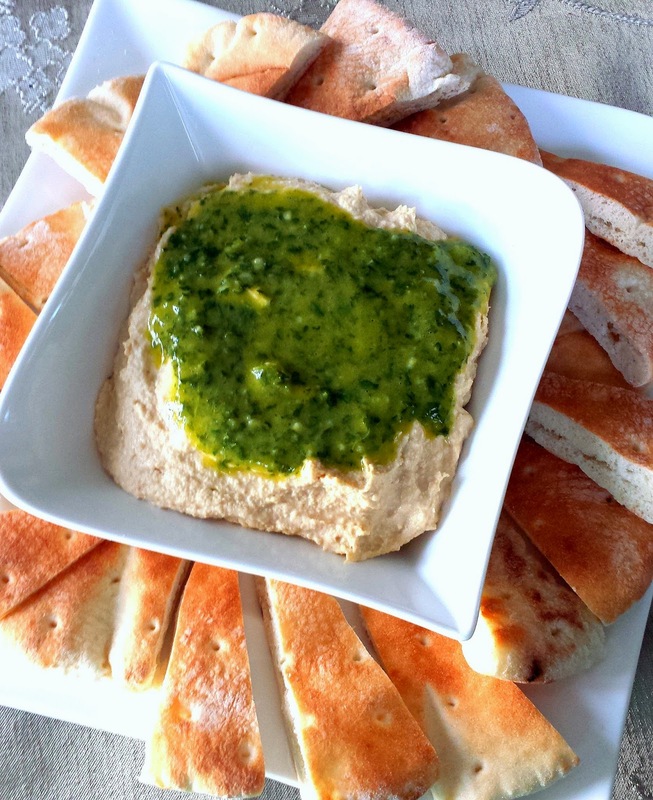 Drizzle the sauce over the hummus and serve with pita bread.